The economic base in the era of New Spain was mining. This brought about the foundation of settlements, having awarded, gave birth to cities such as San Luis Potosí. between Cerro de San Pedro and processing centers, shops and services, a link that laid the foundation for its development was established. The estates were constituted as a system of territorial organization in the region, ranking haciendas profit, livestock, agricultural or mixed. It was in the late sixteenth century: time of expansion and consolidation of numerous settlements; haciendas system immersed in the abundance that followed the flash of that precious metal. It was at that time that the people of San Luis Potosi Mines attracting many immigrants to their prosperity was founded, which were established around until constituír neighborhoods and towns. Among the many neighborhood Tequisquiapan, instead of fertile land in a settlement guachichiles was installed from 1583; Tlaxcalilla founded in 1592, being an important town thanks to the Franciscan convent established on their land. In Tlaxcalilla there was a neighborhood that later would found Tarascan Indians south of the town of San Luis San Miguelito. North of Santiago Barrio comprised guachichiles seated next to the Tlaxcalans, so that the sedentary life of the first to be influenced by the culture of the latter. The pacification of the region was guaranteed and the economy of the consolidated region. Religious buildings were erected as a symbol of faith and prosperity; the mining boom provided the architectural outline of San Luis Potosi - which consists of a central plaza and stretched 19 blocks to the 4 cardinal points- in over 2 centuries, bequeathing to posterity beautiful buildings. The historic downtown Plaza de Armas and Cathedral, consecrated in 1854 this number in the perimeter buildings of outstanding beauty: the Government Palace, built in the seventeenth century, the Municipal Palace with its neoclassical style, etc. Other sites of interest are the Founders Square, a place where the first settlement in the region was formed in 1588, the Convent and Plaza del Carmen, the Alameda Juan Sarabia, Teatro de la Paz was built in the late nineteenth century. Faced with the Federal Palace Theatre, currently the Mask Museum and Telegraph building. The Corn Exchange building and the building of the former Royal Box as Colonial architectural testimony; Monumental and Commercial own palaces, always elegant and distinctive economic splendor of that era Porfirian architecture; French influence with the Crystal Palace, built on part of what was the Beguine in the eighteenth century. San Luis Potosi is privileged in its geographical location, which provides an incentive to open investment and trade relations between various states of Mexico or the United States. It communicates by modern roads and rail, also having an active social and economic development plan that over time increases profits in any social setting. The mining industry is broadly diversified, allowing the supply of raw material to industrial companies, substantially lowering the cost of production. As for capacity, hand potosina work is as adaptable as qualified, and is also less expensive than that found in other Mexican states. The modernization of San Luis Potosi has been a constant which, together with many other qualities, make this an excellent choice downtown for economic development. 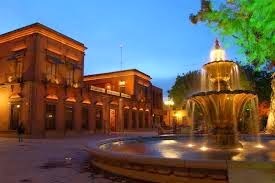 The terms of globalization and total quality are part of this city in the center of the country working city full of history, architectural gems and urban spaces that even now make it sparkle like in those days of glory in the Cerro de San Pedro.San Luis Potosi!